Audree looks forward to this every year, and this was Juliette's first time joining us. We cooked some hot dogs and s'mores, did some swimming in the lake, played with friends, and gazed that the stars. But come bed time Juliette was 100% convinced that when she was in the tent there was a monster outside of it and screamed/cried her head off. I finally calmed her down, and just our luck right then a rustling outside spooked her. 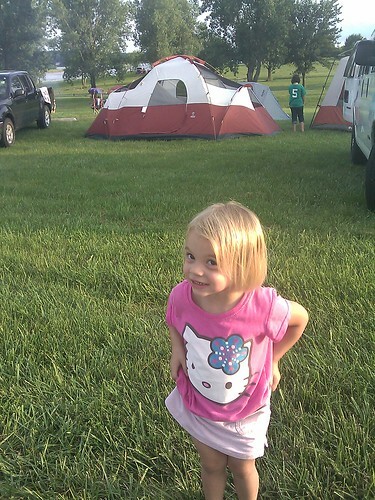 She let out a shriek and scared whatever critter had made it's way up to our tent. Seconds later we smelled exactly who it was. Mr skunk had sprayed. In the pitch black darkness with a crying toddler I broke down the tent, packed us all back up into the car and drove us an hour home. There wasn't enough time to properly stow the tent so I just crumpled it into the passenger seat. The skunk didn't get a direct hit but the wind must have wafted some on the exterior because we would catch a good whiff every now and then in the car. We show up, back at home, at 2am. Future as a banana gatherer?